On Sunday, March 6, 2016, a clear day, the Polish Heritage Society of Philadelphia held its Annual Fryderyk Chopin concert at the Sister Francesca Onley Education Center on the premises of Holy Family University located in the Northeast Section of Philadelphia. This was the actual celebration of Chopin's birthday. 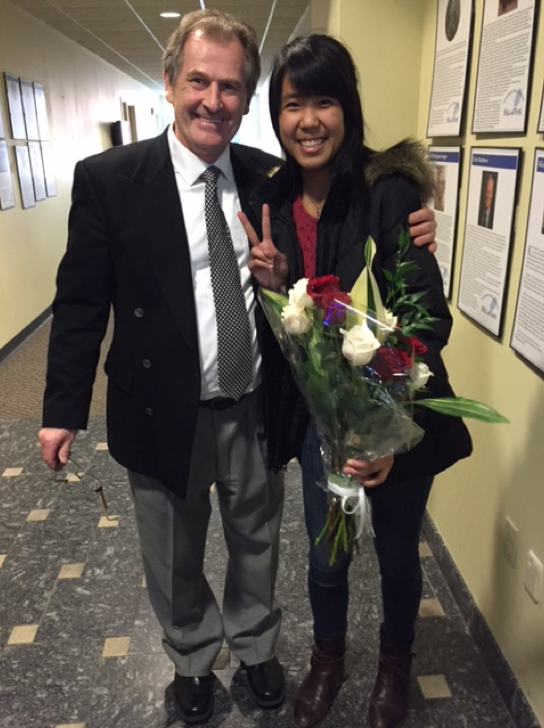 Guest pianist was Katie Liu, Bronze Medal winner at the 2015 Chopin International Piano Competition in Warsaw, Poland. Needless to say, it was a full house. Marie Hejnosz, President of the Polish Heritage Society of Philadelphia was unable to attend, due to an injury she sustained over the weekend and was also scheduled for surgery the following day. Therefore, Deborah Majka, Concert Chairperson and Honorary Consul for the Republic of Poland for the Southeastern Region of Pennsylvania opened the program by welcoming everyone and introducing Katie Liu. Debbie quoted Katie's own words about playing Chopin in her introduction. Katie had replied thoughtfully -- "I really feel at home with Chopin's music. There's so much freedom, of course you have to follow what the composer wrote, but there's so much freedom and so much feeling, his feeling and so much of your own feeling. Really it's all about passion, just playing out your heart!" The theme of the program was: A Classical Odyssey From Mozart to Chopin. Her 1st selection was by Wolfgang Amadeus Mozart, Sonata in B-flat major, wherein her playing wowed the audience with her grace and strength. Earlier, during an e-mail interview she explained the reason for choosing the pieces for the concert. It took some thought to make the selections. "I love Mozart's work in general because of its purity and joy (or mostly joy), as well as its possibility for an exquisite tone of sound." The audience cheered and gave her a bravo with a standing ovation. At the end of the recital and with the Polish traditions, Kate was presented flowers by 2 young children from the audience. In addition, Debbie Majka presented her with a painting of Chopin's home in Zelazowa Wola as a remembrance of her participation in the Chopin International Competition. A wine and cheese reception followed with many Polish delicacies. It was a fitting conclusion to a wonderful performance and afternoon.